In Stratford, ON over the weekend, visiting the famed Shakespeare festival, we took in a couple of local haunts for beer including the new Monforte on Wellington cheese and craft beer café. 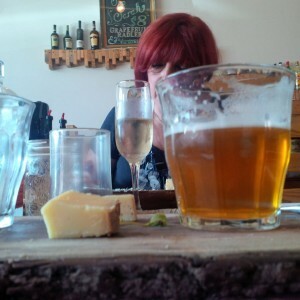 Minimalist yet stylish, the Monforte sums up everything good about the current beer-and-food scene, offering excellent beers (and Ontario wines) paired with selections of local cheese and charcuterie. Two cheddars were tasted, showing all the character one would expect from a café that is the outgrowth of a local dairy. Each had a rich, farmhouse flavour which bespoke the terroir that has informed the thriving dairy industry around Stratford for more than 100 years. These morsels were complemented by slices of summer sausage, the type long familiar in Mennonite country and previously unsung by bistros local or Toronto-ist to my knowledge. The type chosen was particularly good or rather suitable for sampling by urbanites, as they were not as dry and ferociously salty as some of the classic types. One hopes local restaurants will offer more of the Mennonite and Germanic ways with sausage and patés of which the Kitchener-Waterloo region is deservedly famous. There is a rich variety as can be seen at local farmer markets, but these are not often featured in our restaurants. The beers were superb, an IPA from the new Black Swan brewery just a few paces away, and a wheat beer from Railway City Brewing Company in St. Thomas (further south toward the lake) which had a striking black pepper note and lively fresh cereal quality. The Black Swan’s beers are being offered in a number of local pubs and I liked the porter especially, rich but on the dry side, all-malt I’d guess (no raw grains). Stratford changes relatively little over the years at least in the centre, which is part of its charm, but additions like Monforte are all to the good.